The new growth is yellow-green where it has normally been a dark green and it also is getting burned/crunchy. I water them 3x/week as was recommended by two nurseries. They aren’t getting better and a few of them actually seem worse. (Photos attached). Not sure if it’s my soil or what. 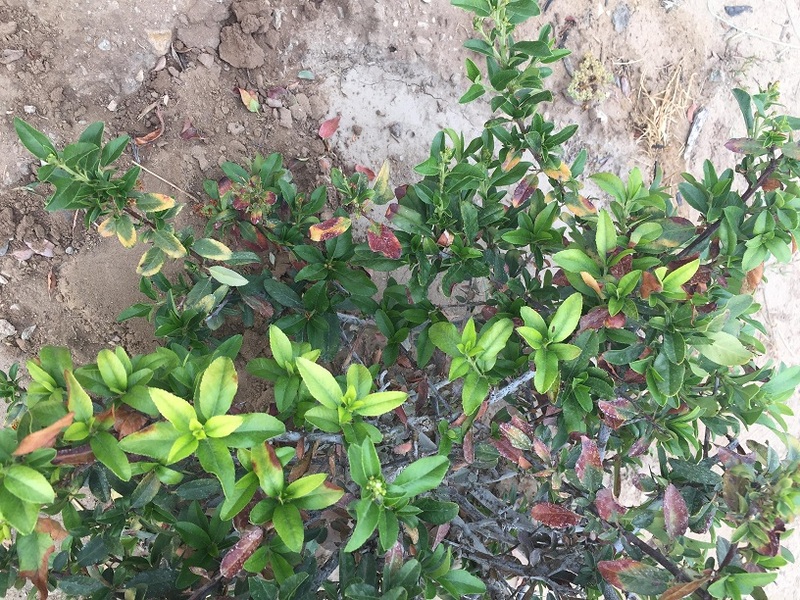 Any info you or anyone else could provide me with would be really helpful since I’m trying to make a waste of the money I spent on these plants with the intent to grow a hedge on a corner of my property. Oh also, I’m in West Point which the NW area of Davis County. John, I am guessing iron chlorosis is the issue. Do you know your soil pH? If not you might want to get it tested by USU’s soil testing lab — see more at usual.usu.edu. If your pH is 7.5 or more that is probably the issue. Alternatively look around the neighborhood and see if many other plants are yellow. If so then that would confirm chlorosis. If it is chlorosis you can treat the soil yearly in spring with iron chelate, but it is expensive and you will have to do it forever. Chlorosis will be worse if you have compact soil and/or waterlogged soil, causing a lack of oxygen in the soil. Watering 3X a week seems a bit much to me. Q: Hello. I hope you don’t mind me sending you these photos of my sick aspen. We live in Summit County. We’ve had a few trees “die” and then leaf out again with new branches at the point where the main tree died. The new leaves are covered with sticky, but I don’t see aphids. They are panted in clay soil. Do you have any ideas about what the issue is and about treatment. 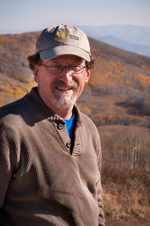 Richard, Aspens have lots of problems, mostly because they do not put any energy into protecting themselves. Your trees appear to have poplar borers in them, which weakens and kills branches and trunks. The first picture looks like iron chlorosis, which is caused mainly by high soil pH. 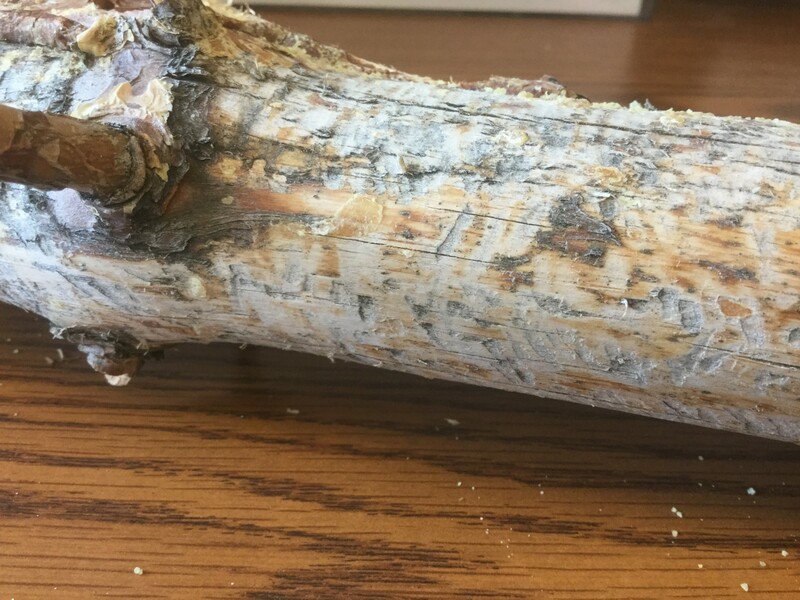 Stickiness would most likely be related to aphids, but stick material oozing from the trunk could be from the borer exit and entrance holes, but also possibly from stem canker, a fungal disease. You might want to read this fact sheet: https://forestry.usu.edu/files-ou/aspen-how-to-grow-a-good-tree-in-a-bad-situation.pdf. There really are no practical treatments for aspens because most of the problems they have are not readily treatable. For example, you can’t keep aspens from getting stem cankers and those are very serious problems for aspens. You can have trees sprayed with insecticide to coat the bark to discourage borer entry, but success is hit and miss and it can be quite expensive, plus you would have to do it every year or two. Also such sprays have no effect on borers already in the trees. Chlorosis is treatable by adding iron chelates to the soil, but again it would be fairly expensive and would have to be done every year. 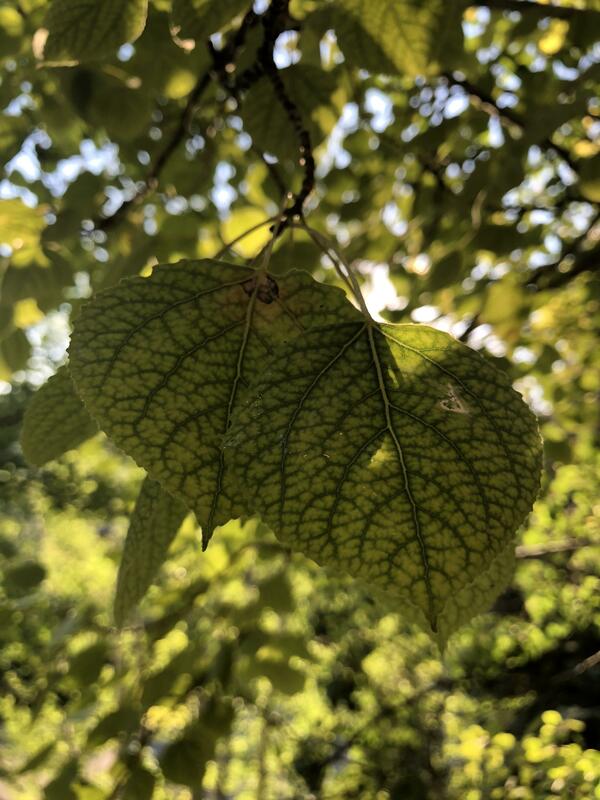 Actually the chlorotic leaves you send a picture of are likely chlorotic not due to the soil pH, but I suspect that branch or tree was very stressed by other problems. 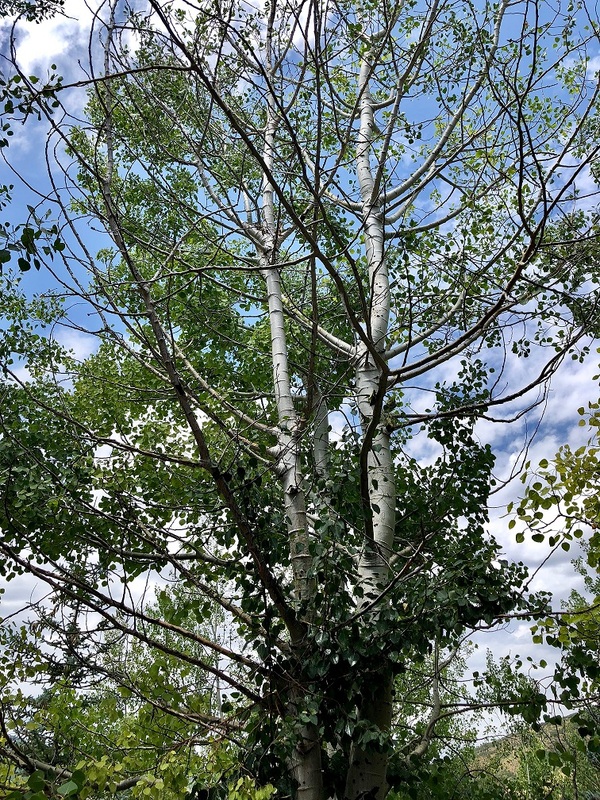 Irrigating is a good treatment, since most of aspens’ problems are made worse by water stress, but usually large scale irrigation is not practical and it won’t help the already heavily damaged trees. The best treatment is to cut down the oldest trees with the most problems, which will encourage sprouting from the roots. The new sprouts are much more vigorous than the old trees. You can retain the healthier of the big trees, then you can thin the sprouts. The factsheet I cited (above) describes this process. Q: I have three trees in my yard, a maple, a red bud and a honey locust (I think). The trees appear healthy but the people who do my lawn care want to sell me a package of at least 4 treatments, nutrients, oils, etc. Do I need to purchase a preventative tree care plan for healthy non-fruit trees? Also, could you let me know what I should look for in an arborist for trimming? Any suggestions? I would also like information on the lunch webinar series. I don’t know much about tree care, or gardening for that matter, and I would like to learn more. Thanks. A: The number one thing that all trees need is adequate water. Of the species you mention, the honeylocust and the redbud are fairly drought hardy and the maple depends on what species of maple it is. Trees rarely need fertilizer (nutrients) beyond what they can get from normal Utah soil. I have no knowledge of how you could help a tree by adding oils, other than horticultural oils that are used sometimes to smother insects. I would keep my money in my pocket. If your trees need pruning you can do it yourself (see https://forestry.usu.edu/files-ou/pruning-landscape-trees-an-overview.pdf), or you can hire someone, preferably an ISA Certified Arborist (not a licensed arborist – that just means they have a business license). You can get webinar info at our webinars page. Q: Hello, my husband and I live in on the Wanship/Hoytsville line, about 15 minutes from Kimball Junction and Park City. We have several Scotch Pine trees which are between 50 and 60 years of age, beautiful trees in our front yard. Last fall we noticed the last tree in the row was losing needles, and the tree branches were turning brown. Most alarmingly, the upper part of the trunk began to lose its bark. I called the county agent and he suggested that we soak the tree root ball well just before the ground froze, which we did. This spring we lost tree. We fear that it is bark beetle. We've taken it out, but can now see the beginnings of loss of bark in the upper part of two more trees. Is there anything we can do to save these beautiful threes? Attached is a picture of one of the upper branches of the tree that went entirely brown and which we cut down. Does this look like the awful work of bark beetles? If there is anything I can treat the upper bark with to kill or halt the beetles, I will do it! Thank you for any help! A: Maryanne, This doesn't look quite right to be due to bark beetle feeding. It looks more like what you would get from an animal scraping the bark and cambium with its teeth. Of course if that were to happen the bark would come off as the feeding was occurring. If bark beetles attack a tree they make an entry hole, tunnel within the inner bark in a predictable pattern that varies by the type of beetle, they lay eggs in their tunnels, the eggs hatch and the young larvae make tunnels that also have a predictable pattern and are smaller in diameter than the adults' tunnels. Eventually they mature and tunnel out through the bark leaving an exit hole. The tunneling of many attacking insects eventually weakens and then kills the tree, but the bark does not come off until that part of the tree is dead. What I am seeing on this tree does not look like bark beetle tunnels. It looks more like the scraping of teeth. Animals (non-insects) that scrape off bark to feed include porcupines, squirrels, deer, elk, horses, rabbits, mice, and voles. It might seem that you would notice a porcupine feeding, but they mainly feed at night, so you might not. You also might not notice squirrels as they were feeding, and rabbits, mice, voles, and large ungulates (deer and elk) would not be able to reach that far up. If I had to guess I would say that it is bark stripping and not insect damage, and that it is porcupines rather than squirrels because the tooth marks look too big to be from squirrels. To see what their feeding looks like search Google for "porcupine bark feeding" and click on the Images button. It will be difficult to control porcupine damage. It is probably not legal to trap them or shoot them, though your UDWR local office might have suggestions. Your area is covered by the UDWR office in Ogden, phone number (801) 476-2740. If you search the web for "porcupine control" most of the suggestions focus on live trapping. There is a good article at http://icwdm.org/handbook/rodents/Porcupines.asp. I'm not sure if you're the proper person to contact, but I had a question. I found this in the Coral Pink Sand Dunes Area and wasn't sure what it was. It's about 3 inches long. 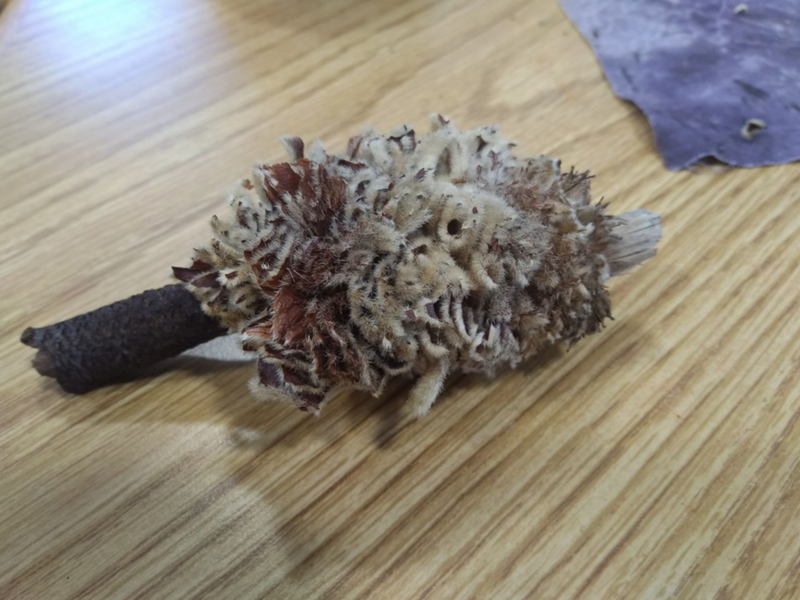 We believe it's a type of fungus and people have suggested it's a magnolia. I'm not native to Utah or the Kanab area so I'm not sure if magnolia's grow down there. If you can help identify it or direct me to someone who could I'd be very grateful. A: Freddy, It is not a magnolia. There are planted magnolias in Utah but none in the wild. I believe that it is the beginning of a witches broom or something like that. A witches broom is simply an area of abnormal growth that forms on a woody plant and leads to a proliferation of growth in one area. It will tend to grow in that abnormal state year after year, which can cause the shoot that it is growing from to die due to disruption of the vascular system. That may have happened here. Witches brooms and other abnormal growth can form as a reaction to a virus or another pathogen or for no apparent reason, but all likely happen due to a genetic mutation. Burls on tree trunks are another form of such a mutation. Sometimes the shoot grows in a flattened form which is called fasciation. These growths are essentially plant cancers. They will continue to grow until they can no longer be supported by the plant they are attached to, and then they will break off or they will lose their source of water and other materials they need to survive as they disrupt the vascular system. Generally I don’t think that they are contagious, and if you prune them off below their point of attachment they will die and will not come back, at least on that shoot. These types of growths happen on many different types of plants and on a particular plant they can happen in association with different parts of the plants, but usually are associated with the formation of vegetative or reproductive buds. This one looks like it could be either of those. You would have to pick it apart and look for reproductive structures to tell which it is. If you had more of the plant farther down where it is growing normally I could tell you what plant it is. It looks like it would be from an angiosperm, not as gymnosperm. It could be from a willow. Q: Is there anything known about the “tipping point” or ways to predict native trees decline due to drought stress? Most of our native trees and plants are drought tolerant, but in recent years we have had longer periods of no precipitation, high temperatures, big fire seasons, and have been seeing more symptoms of drought stress and other insect/disease problems combining to cause tree death. This is in native forests and rural situations. ( inland northwest- montana, Idaho eastern Washington. Primarily ponderosa pine, but some other species like doug fir and cedar also). A: Sharon, There is a tipping point, but it would be different for each species or forest type and what you would measure to indicate whether this point has been reached would vary. If the trees are coniferous evergreens then the best indicator may be how many years worth of needles are on the tree. Severely stressed trees will often lose last year’s needles before the next growing season is over. Also stem (trunk) diameter growth is a good measure of stress. Slow growth is a sign of stress. Finally, susceptibility to insect attack is a good indicator of stress. Q: I live in Cottonwood Heights but am currently visiting friends in the southwest of France, in Toulouse. Here is a question you have probably never had before! In the north of Spain, in the Basque region, they make a walking stick from a wood Neflier (makhila is the generic name for the walking stick). Is there any equivalent of Neflier in the US? A: Tom, Yes. Neflier is a French name for the genus Crataegus or hawthorn. The Spanish name is Espino. Utah has one native hawthorn – black hawthorn or Crataegus douglasii. I see it all over the place at fairly low elevations where there is some water. It is a muiltistemmed tree or a dense shrub, but some species of hawthorns are tree-like, and many of these are planted in Utah. To learn more about hawthorns go to our Tree Browser website at www.treebrowser.org. Q: A cut aspen tree, with the stump still in the ground, is sending out a huge amount of shoots. Can anything be done to kill the stump, outside of removing it? Can the shoots be killed with some product? Help! A: Judy, Not really. Just cut it down and spray triclopyr (e.g. Ortho Brush-B-Gone or Poison-ivy Killer) or glyphosate (i.e. Roundup) on the stump surface (it is better if the stump is freshly cut), and cut off any sprouts and treat their cut surfaces too. It may take several rounds of this until everything is dead. Q: I have a Kentucky Coffee tree in my landscape. It was healthy last year, but this spring just as the leaves were emerging, it was hit by a frost (about 30 degrees F) which killed the newly emerging leaves. A few weeks later new buds had formed but as the leaves emerged they are deformed, almost looking like epinasty from 2 4 D (but no herbicides have been used and the tree branches as 6+ feet above the ground). All leaves are affected. All the information I find on the web indicates that the Kentucky coffee tree is rarely affected by pest or disease, but something is obviously wrong. I have included 2 photos of leaves. Do you have any ideas what is wrong? 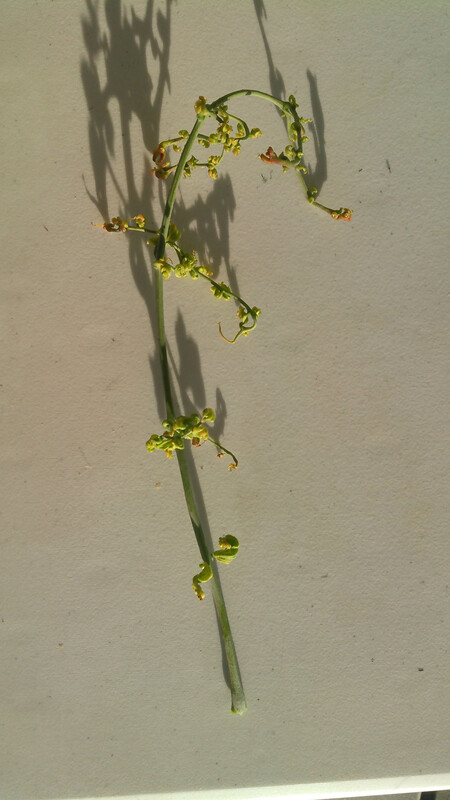 A: John, I thought this was going to be a case of deformation due to frost damage of tissues still in the buds, but after looking at the pictures, I don’t think so. For one thing, the type of damage that causes usually does not include twisting like this. It is more small holes and bumps. Also it doesn’t make sense since new leaves produced after the original leaves were killed would be from tissues produced after the frost. So I am still thinking herbicide. 2,4-D can drift quite a bit, especially on warm days when it volatilizes. The amine form is the most common and is not as bad as the esters (there are low and high vol esters). Some plants develop cancer-like growths on some of their tissues and these growths often involve flattening and twisting. 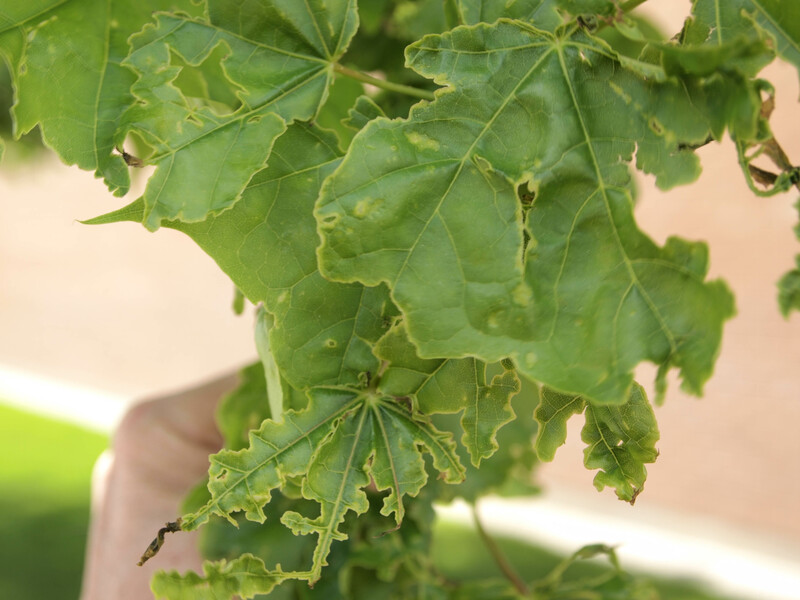 Though this is not completely understood, it appears to involve genetic changes in the tissue in certain areas on the plant, and pruning off those areas gets rid of the abnormal tissue in that area. These genetic changes seem to be triggered by viruses, maybe bacteria and fungi, certain insects (forming galls), etc. I don’t know if frost damage could trigger this kind of thing. There is a good article on this in the NY Times at www.nytimes.com/2015/07/28/science/cellular-cheaters-give-rise-to-cancer.html. I have attached a picture of one type of such growth called fasciation, that involves flattening of branches. 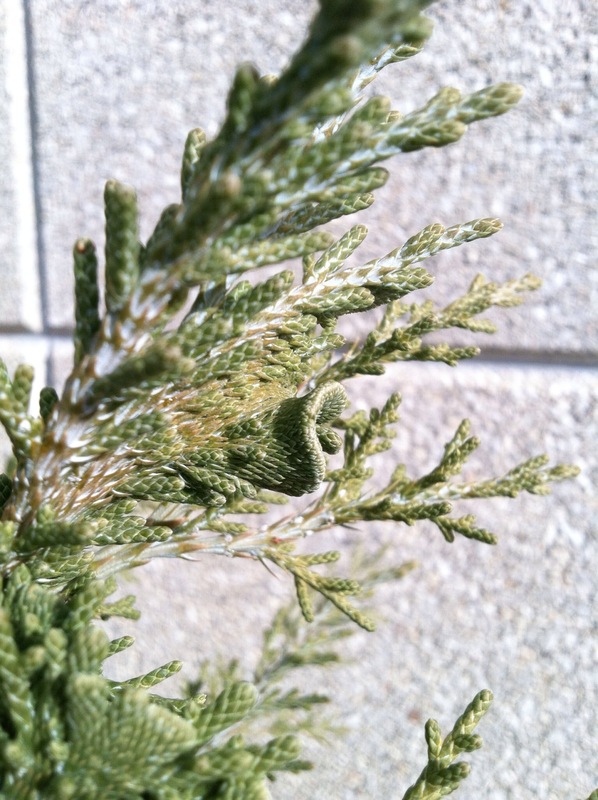 This one is on a juniper here on campus. I also attached a photo of some frost damage on a maple. I recommend that you watch it and see what happens. It won’t spread to other plants and it may go away. There is nothing you can do about it, so you might as well let it go for awhile. If you do, please keep me informed. Q: I planted the Bur in March and have been excited to see it leaf out. I have noticed that a good number of the leaves aren't the typical dark green that I've seen, and am attributing this to stress. That being said, the leaves are a mixture of light green to yellow/bronze. The veins themselves are still green and the leaves don't appear to be wilting so far. I've also read that this could be a sign of over or under watering the tree. I've attached a photo to better highlight what I am seeing. Any help you could offer to get this tree in good shape would be appreciated. A: The leaves look perfect for this time of year. Many plant leaves have some red in them as they emerge, but before they mature. The chlorophyll that will absorb sunlight and use that energy (along with CO2 and water) to make food through photosynthesis is not fully mature at first, and the sun would bleach the chlorophyll without some protection. The red pigment is there to absorb that light and protect the chlorophyll until it can absorb light on its own and use the energy. Some trees retain the red pigment and are more-or-less red all summer, while with others it fades and the leaves end up pure green. Your bur oak will be the latter. In a cool, prolonged spring like we are having this year, the red may hang around longer since the development of the chlorophyll is delayed. Q: When is the best time of year to plant trees? A: Trees are best planted when they are still dormant with tight, unopened buds in the early to mid-spring after the soil has thawed. Cool temperatures and good soil moisture in the spring help trees get established. Fall planting also works well for many species, though watering is critical if the fall is dry. Summer planting of B&B (balled-and-burlapped) and container plants can be successful, though hot temperatures, dry conditions, and non-dormant trees makes good care especially important and survival less sure. Bare root trees should only be planted in spring while still dormant. Q: Of those types of trees, which is best? A: Landscape trees and shrubs can be obtained in four basic types: balled and burlapped (B&B), container/potted, bare-root, and tree-spaded. Each type has advantages and disadvantages and none is ideal for all situations. Bare-root will give the tree the most naturally formed root system and they are less expensive, but they are not commonly available from nurseries. B&B trees are good because they have been grown for several years in soil and are more likely than potted trees to have a well-distributed root ball. Potted or containerized trees are the worst, with it much more likely that the tree will develop root system problems like girdling roots and buried root collars. Spaded trees are good but may not be available. Q: How large does the root ball need to be? A: With all four types you need to have an adequate root system – a good rule-of-thumb is that the root system, root ball, or container diameter or spread should be 10 inches to 12 inches for every inch of stem caliper (diameter at ground-line just above any basal swell). Therefore, a 3-inch caliper tree should have a 30 inch to 36 inch wide root ball as a minimum. Root ball depth is not as critical as width but should be larger for larger trees. 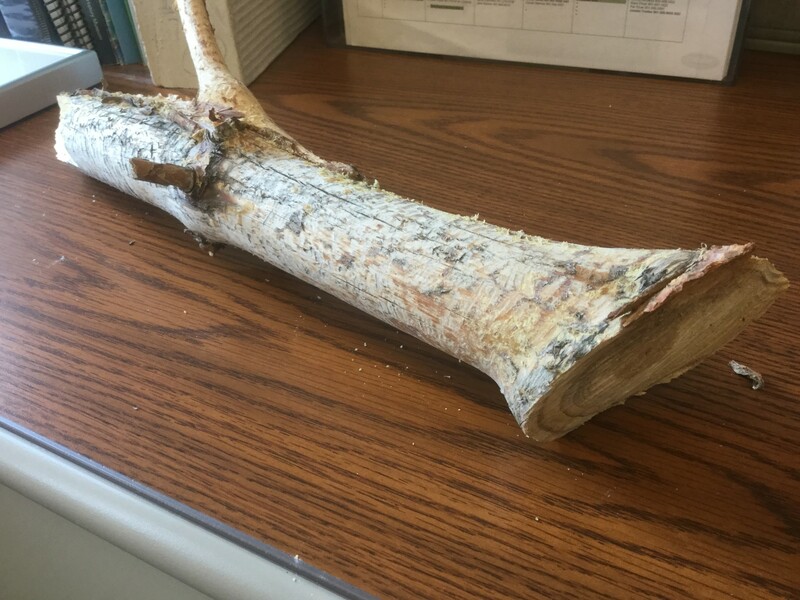 Q: We have cut down a maple, sycamore and ash tree that were growing in our yard and roots had spread on the surface causing the grass to die. How far down do we need to remove the roots so grass can grow? A: The roots did not kill the grass. Shade from the tree did, along with competition from the tree for water and space to grow. Just remove the stump and roots down a few inches so you can put some soil down so the grass roots have soil to grow in. 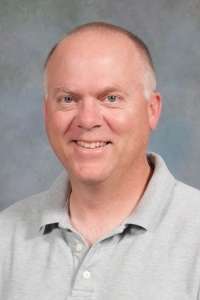 Q: Hi, we live in Grantsville out past Tooele and we were wondering if it is too early to prune our Peach and apple trees. Could you help us on this? A: It is definitely not too early to prune apples, and probably not too early for peach. Because pruning can result in a slight loss of cold hardiness sin the remaining branches, it is generally recommended that you don’t prune until the risk of severe cold has passed. Many commercial growers are now pruning peaches, but also watching the weather. If there is extreme cold temperatures (single digits) in the forecast, then stop pruning until the cold weather has passed. 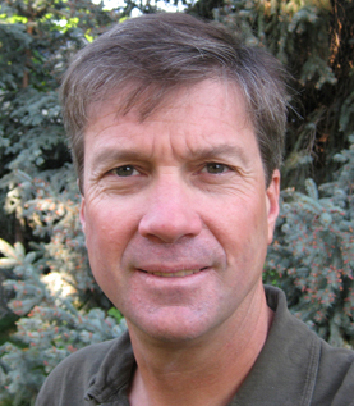 Q: Is the blue spruce on my property is at risk for bark beetle infestation? I go every year to chop down beetle killed trees in the Uintas, (pond pine, white fir), I bring it home, and use it for firewood. I have a blue spruce that I'm concerned may become infected. A: You are only putting your spruce at risk if you bring spruce logs down to your property; beetles are species specific. Bringing ponderosa and white fir will not threaten the spruce. Hope this helps. A: It is not too early to prune apples, and probably not too early for peach. Because pruning can result in a slight loss of cold hardiness in the remaining branches, it is generally recommended that you don’t prune until the risk of severe cold has passed. Many commercial growers are now pruning peaches, but also watching the weather. If there are extreme cold temperatures (single digits) in the forecast, then stop pruning until the cold weather has passed. Q: I recently purchased a lot and built a house in Delta, UT. The soil here is very alkaline and I am trying to come up with some sort of plan as to how I will be able to get some trees to grow. 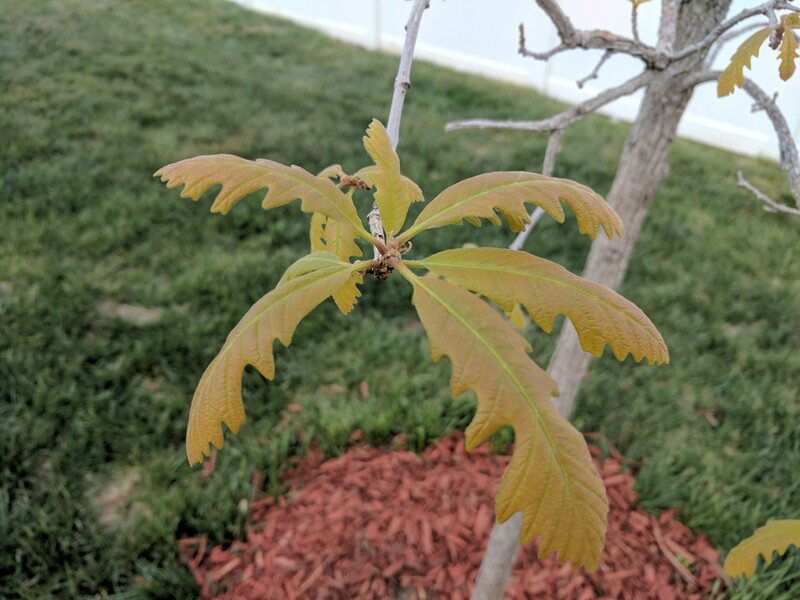 I've heard that green ash can do well in this environment but I'm having some difficulty in finding any good info on what and how to plant. Please, if you have any suggestions or could even point me towards some literature on this topic I would be very grateful. A: Green Ash does well in high pH soils in Utah. Planting really is nothing out of the normal, make sure that the hole you plant in is 2 to 3 times larger than the root ball and mix the excavated soil with a good compost to enhance the organic matter content of the repacked soil. This will improve the soil structure over time around the roots and the tree should do well. If planted in with a lawn, the regular fertilization of the lawn will provide sufficient nutrition to the tree as well. Be sure not to cover the crown area of the tree (the point at which the shoot and root join). This can cause rotting of the bark above the crown and the tree will be susceptible to fungal and bacterial disease. One piece of education and advice. Utah soils are alkaline because of the large quantity of Calcium Carbonate (or lime) that they contain naturally. Utah soils can contain anywhere from 15 to 40+ % lime by weight. This lime is a very reactive buffer against pH change and consumes large quantities of acid as it dissolves. One would have to dissolve ALL the lime in the soil before pH can be lowered. In practical terms, this is impossible given the scale of the requirement for acid to accomplish this. One percent by weight of an acre 12 inches deep is 40,000 lbs or 20 tons. Utah soils therefore contain 15-40 times 20 tons of lime in the top foot of an acre of land. So, you can see the problem of scale we are up against. Even our irrigation water contains large quantities of dissolved lime (hence the nice hard water deposits on our faucets and drinking glasses and our windows after the sprinkler wets them!). So, there is just too much pH buffer in our systems to ever try to adjust pH. Better to select plants that are tolerant of alkaline conditions. Q: I’m a hiker (and hike leader) and recently came across a pine tree that I can’t identify. It is located in Sterling Forest State Park, Tuxedo NY, and is one of its kind that I have found. It has a dark green, almost blue, glossy, thick, 5-6 inch needle, with three needles to a bundle (fascicle). I know its not a white pine (there are lots of them and they have 5 needles to a bundle) and my research seems to believe its a Pinus Ponderosa or Pinus Jeffery (pine), neither of which are native to this area and are predominately in CA and the far west region of the USA. Could it be someone planted it? If it helps, the tree is near Sterling Lake, once a mining area for magnetite. This is driving me crazy!! Can you help? A: Actually, that is a better description of Austrian pine (Pinus nigra). They have needles in 3s (ponderosa is in 2s and 3s), and 5-6" long needles (ponderosa needles are longer). If you have cones, ponderosa has sharp prickles on the tip of each scale. Austrian has a bump, but no prickle. And mature buds on an Austrian pine are white, while they are reddish-brown on ponderosa. Q: I have an Elm tree that is dripping a clear liquid on my lawn. The areas of the lawn affected by the liquid have been killed. Do you have any suggestions on how to remedy this? A: Gene, the only thing that might do this is bacterial slime flux that oozes out of wounds in elms, willows, and some other trees. Normally the waste from this disease runs down the trunk from old pruning wounds and eventually kills grass. I haven't seen this in the form of dripping material, but I suppose it could happen. Regardless, there is nothing you can do about the disease, and it doesn't harm the tree much. If you mulch under the tree there won't be any grass to kill. 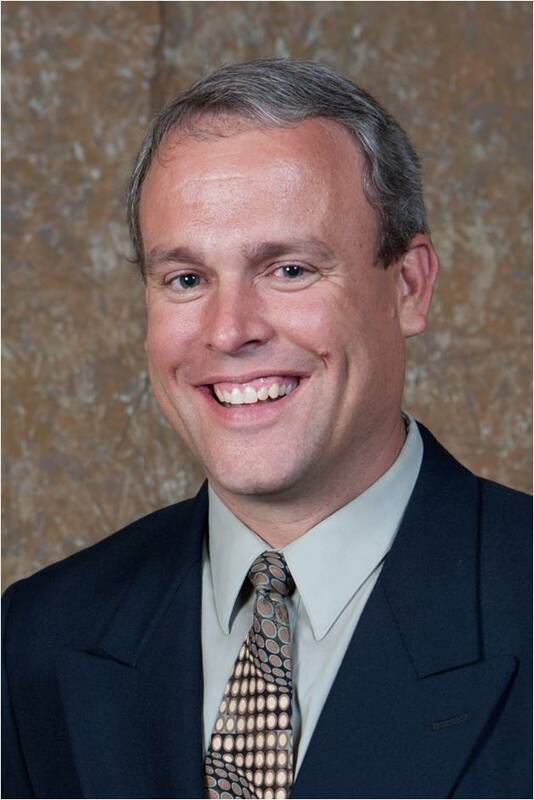 Q: We live in Blanding, Utah and planted 52 new 4-6 ft. trees in March 2016. We have been watering them 3 times a week (about 10 gallons per watering). Now that it has cooled off and turning fall, how often do they need watered? A: Roots will grow as long as the soil they are in is moist and while the soil temperature is above 40 degrees F. And it is good for roots to keep growing because it will speed the trees' recovery from transplant shock. But once it cools off enough then little water will be transpired from vegetation and it won't take much to keep the soil moist. So as long as it stays cool you can back off to maybe once every couple of weeks, or don't water at all if you get significant precipitation. A good way to tell how deep you are watering if the soil is not too rocky is to use a probe like a long screwdriver or a steel rod welded to a handle to form a tee. It will penetrate moist soil and will stop when it reaches dry soil. You would like to water enough that the soil is moist down to at least a foot. Q: I have an ornamental weeping cherry, and I believe it was grafted. I would like to prune it so it can retain it's weeping form. What do you suggest? A: With grafted plants it is important that you know what is the rootstock and what is the top. Often plants are grafted just above ground with one plant that has it's top completely removed, the rootstock, and one or more plants that have no roots but are desired for traits that their tops have. In the case of almost any trees that have a weeping top and an upright stem, you actually have 3 or more plants -- the rootstock, the upright stem (which may be a part of the rootstock), and the weeping part. And on some ornamental cherries there may be several top branches attached to the top of the upright stem. 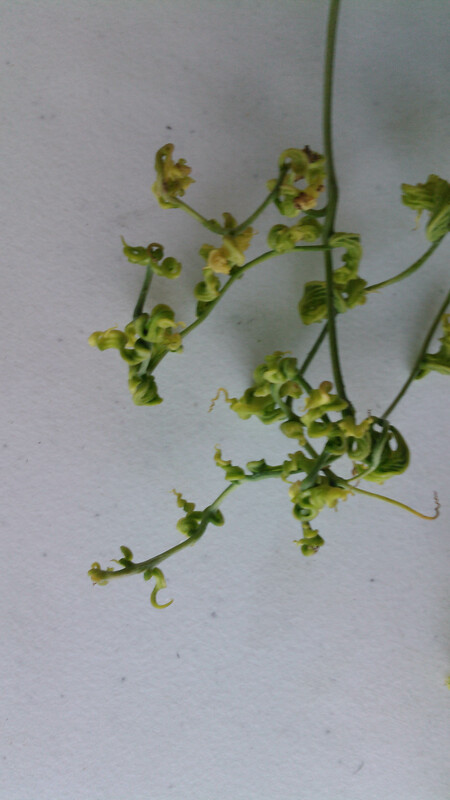 Any of the parts of such a plant may form buds and those buds can grow new top material, but if you want to retain the grafted form as it was meant to be, you have to prune off such shoots. In some cases, like with twisted forms, the twisted top may actually grow slower, and if a straight shoots come off of the rootstock, they may eventually shade out the twisted parts.